TriCity Church is launching its first Young Adults Bible Study! Beginning Sun Feb 17, we will be meeting every other week at the church from 4-6pm. 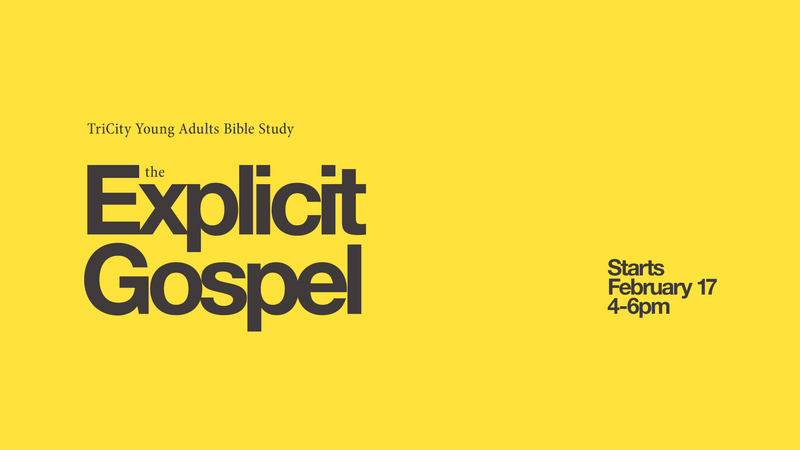 We will be working through the video series for Matt Chandler’s “The Explicit Gospel” together and going through the attached workbook. We’ll watch the teaching, discuss the material together, pray for each other and hang out afterwards. This is going to be a great opportunity for us to take our faith seriously and joyfully aspire to Christian maturity together! Bring $18 to cover the costs of the workbook (if money is keeping you from joining in, let us know and we can help you out). You can pay at the connect desk on Sunday morning or on the first day of the study (cash or debt). You can also find updates at our Facebook page here! Looking forward to growing alongside you!